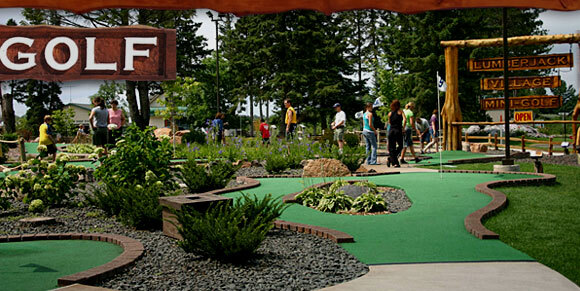 Golfers of all ages will enjoy the challenge and beauty of this most outstanding course. The area’s grandest waterfall feeds streams, ponds and fountains. Greens and fairways wind around native blooms and granite outcroppings. 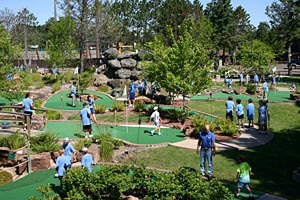 The unique terrain, water obstacles and hidden hazards guarantee fun for even the best Mini-Golf players. Includes a ticket to Scheer’s Lumberjack Shows, a Round of Golf (18 holes) and a bag of popcorn. Had so much fun you want to golf more? Additional rounds of golf for only $3.00 per round. An outdoor activity everyone will enjoy. Great for family reunions, corporate outings, scout and youth groups. for your group and discount options. © 1972 Scheer's Lumberjack Village. All Rights Reserved.